Rep. Ted Deutch, D-West Boca, and Vern Buchanan, R-Sarasota have filed a federal animal cruelty bill. 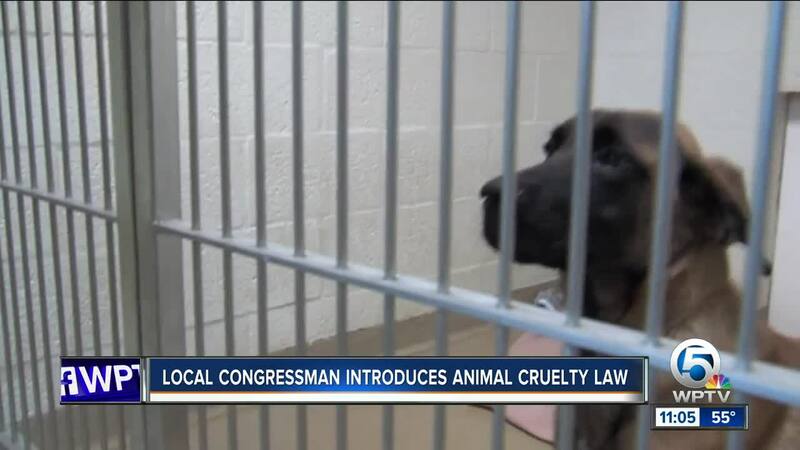 WASHINGTON — A pair of congressmen from Florida want to make animal cruelty a federal crime. Rep. Ted Deutch, whose district represents parts of Palm Beach and Broward Counties, is one of the main sponsors of the Preventing Animal Cruelty and Torture Act, or PACT, along with Rep. Vern Buchanan of Sarasota, Florida. If passed by Congress, anyone who engages in animal crushing, burning, drowning, suffocation, impalement or other serious bodily injury could be charged with a federal felony. "This is commonsense, bipartisan legislation to bring some compassion to our animal laws," Deutch said. "For many Americans, animal welfare is an important policy issue, and the idea of animal abuse is abhorrent." "The torture of innocent animals is abhorrent and should be punished to the fullest extent of the law," said Buchanan. "Protecting animals from cruelty is a top priority for me and I look forward to working with Congressman Deutch on this important issue." The Humane Society, National Sheriffs' Association and the Fraternal Order of Police have all endorsed PACT. The Senate passed an identical bill during the last session of Congress.